Tomorrow is the 3.2 Run in Remembrance at Virginia Tech in Blacksburg. This run is held in remembrance of the 32 lives we lost on April 16, 2007 in the shootings. This year will be the 5th year for the Run in Remembrance. The race is an untimed, social event that allows the community to come together. Everyone wears race bibs, but there are no bib numbers. Instead the bibs say “I run 3.2 for” and then there’s a blank for you to write in who/what you run 3.2 for. I will talk about more of the race details in my race report tomorrow. For today, I thought I would share with you my personal experience on April 16 and the days and weeks following. I am just going to share my experience, so if you want to know exactly what happened that day you can find that HERE. I don’t think this is a story I could actually fully share out loud with anyone anymore. I had to work on the actual post in bits and pieces. On the morning of April 16, 2007 I was a freshman at Virginia Tech. It was a Monday morning and I remember that it was snowing. I was asleep in my dorm room, in West Ambler Johnston Hall (known as West AJ). I remember waking up to loud pop, pop sounds, but I went back to sleep. The doors in our dorm had a tendency to get slammed shut if they were open and the door across the hall got opened. I was used to getting woken up by slamming doors. It took me a few days to realize the sound that woke me up that morning was the sound of the first two victims being shot on the floor below us. Not long after I had fallen back asleep, my roommate (who was and is still my best friend) and I were woken up by our RA knocking on our door. She told us that there was a situation in the dorm and that we were to stay in our room. At this point we had no idea what was going on, so we just stayed in our room (after making a quick trip down the hall to the bathroom and back). I had a quiz in my biology lab that morning at 10:15 so I sat down at my desk and started to review my notes. As the morning went on, we received email notification from the university that there was a shooter on campus and everyone was to remain inside and away from windows. This is when we began to make the connection to there being an “incident” in our dorm. We turned on CNN and they had an ongoing story covering what was happening on our campus. The shooting had started that morning in our dorm, and then a few hours later had finished in Norris Hall. Everything gets kind of blurred together at this point, but I can remember sitting there watching the death toll creep up and up (so far it was at 20). My best friend and I kept saying that it couldn’t be right, it had to be wrong. This is when the phone calls, emails, text messages, and facebook messages started. I didn’t have the best cell reception in my dorm room, but I was able to let my parents know I was OK and was on lockdown in my dorm. I had a hard time getting in touch with friends who were at Tech, and other friends/family members were not able to get in touch with me. Eventually we lost internet service and cell phones weren’t working because everything was being overloaded. The girl who lived across the hall from us came into our room crying and upset because her roommate had left for class before the lockdown and she couldn’t get in touch with her. It later turned out she was fine, and on lockdown in her classroom, and just didn’t have cell phone service, but we didn’t know this at the time. She stayed in our room for a few hours and eventually (when they found the gunman, who had taken his life in Norris Hall) the lockdown was lifted. Barry (now my husband) and I had been dating for about 2 weeks, and he came and got the three of us (me, my best friend, and the girl who lived across from us). The girl from across the hall still hadn’t heard from her roommate, so we took her over to the Inn at Virginia Tech, which is where they were notifying friends/families of victims. This is where the families went who hadn’t heard from their loved ones. I didn’t actually go in, but I saw people coming out who had obviously just received the worst news in the world. I wish I had never gone there. We dropped off our dorm mate and my best friend (who went with her for support) at the Inn, and Barry and I went to his apartment. There, we continued to watch the news coverage with his roommates and friends, and finally saw the death toll stop at 33 (this number includes the gunman… the 3.2 for 32 just counts the victims). A group had been set up on Facebook called “I’m OK at Virginia Tech”. We joined the group and were able to search it for friends we hadn’t been able to get in touch with. This was when I found out I had a friend from high school who was shot twice in her back and also had a bullet richochet into her foot. If you saw any pictures from that day, you probably saw the one of her in a white t-shirt and jeans being carried out of Norris. She was taken to the hospital, where she had emergency surgery. She recovered from her injuries and now hsa a non-profit organization promoting school security: the Koshka Foundation. Later that evening I returned to my dorm. I don’t think at this point I was able to fully understand or comprehend what had happened. All classes were canceled and a lot of people were making plans to go home. The next day they held a convocation on campus in Cassell Coliseum, where basketball games are held, and I attended it with my best friend. There were so many people there that they had to have people sit on the football field and watch the convocation on the Jumbotron. There were a lot of people who spoke, using words like “senseless tragedy” and “no words to explain”. I remember President Busch telling us that people we didn’t even know were praying for us. And then Nikki Giovanni, an English professor at Tech, got up to speak. Her speech was both moving and exactly what we all needed to hear. It ended with everyone doing a “Let’s Go Hokies!” cheer over and over again. If you haven’t seen it before, watch the youtube video, it’s worth the 3 minutes. In the days to follow, I couldn’t leave my dorm or walk around campus without being bombarded by the media. I always declined to interview or speak with them, though. The university held a candlelight vigil on the Drillfield (a central grassy area on campus) for everyone to come together and pray. They had set up a makeshift memorial, and many of the things that had been sent in support were on display. 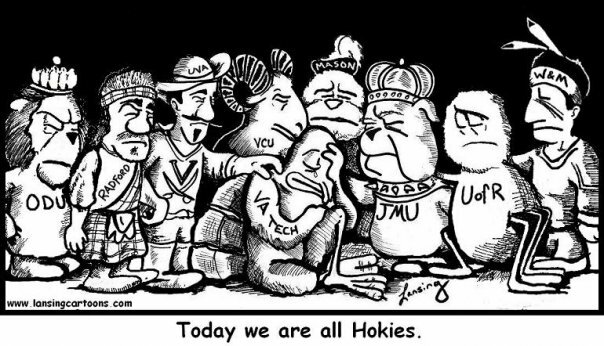 Schools and organizations across the country sent their support, telling us “today, we are all Hokies”. We all stood there together in the dark at the vigil holding up candles in remembrance. And once again I was overcome with sadness. In the following weeks, classes eventually resumed, although returning to class and taking final exams was optional. I went back to a few of my classes, but our professors mostly just talked to us about what had happened and allowed us all to talk as a group with each other. Although this often caused me to cry, I think it really helped me work through things. On that day we lost 32 students and professors, and another 15 were injured. I wasn’t close friends with anyone that lost their life, but I was acquaintances with the girl, Emily Hilscher, who was killed in our dorm that morning. We were both freshmen in the College of Agriculture. I also knew who the RA was, which was the other person killed in our dorm. He actually lost his life because he heard the gunshots and came out of his room to try and help Emily. In total, we lost 6 students from our freshman class. To this day it can still be very hard at times to think of or talk about what happened. Sometimes completely random things make me think of it and every time there’s another shooting it brings it all back. Sometimes it makes me feel very sad, and other times I actually feel sick to my stomach. Almost always it gives me goosebumps all the way up my neck and on my face. Sometimes it also makes me mad. Often when someone finds out I went to Virginia Tech they will ask me “Were you there?” . When I answer “yes” some of them will even ask “Did you know anyone?”. I usually just tell them “no”. It doesn’t happen as often as it used to, but it still happens. That day changed my life forever, along with many many others. For example, I now have a tendency to analyze a room when I walk in and plan where I’d hide or how I’d escape if I had to. The events that day affected so many people, both directly and indirectly. I’m glad we’re able to have social-type events, like the 3.2 for 32, which allows everyone to come together. I’m usually not sad at the 3.2 Run in Remembrance. It’s a great feeling to come together to run/walk 3.2 miles to honor those we lost. It’s a way of living Nikki Giovanni’s words: “We Will Prevail”. The university has a webpage called “We Remember” in remembrance of the victims. You can read about each of them there, if you’d like to. It took me 45 minutes to reach my son that day, and those were the longest 45 minutes of my life….. I cannot. imagine. going through what either of you went through that day. Words are not enough ~ but I’m a mom. That sentence doesn’t seem like it’s done, but, words are not enough. It was an awful day and I know it must have been so scary for people trying to get in touch with their loved ones. I’m glad you son was safe and I’m sorry for the loss of his teacher and his good friend. Oh my goodness, how terrifying it must have been to be there and so close. I can’t even imagine. I got goosebumps reading through this. I am so glad there are organized annual remembrances. Big hugs to you–I’m sure it will be an emotional experience! I am really glad they continue to hold a Day of Remembrance and continue to have the run. It’s a great way to bring the community together. This was really hard for me to read! I was at Christopher Newport when this happened, and even though I didn’t personally know anyone at VT, a LOT of my friends and roommates and teammates did. I can’t imagine what it was like to be there and experience it first hand. This run sounds like a wonderful way to remember everyone who was lost that day and everyone else who was affected by it in so many ways. You are exactly right- the run is the perfect way to remember those who were lost, but not in a sad way. Sometimes it’s easier to think about stuff while running. It is so brave of you to post this. I cannot even imagine your sorrow/grief or recovery. Thanks, Stephanie. I had to work on this post in bits and pieces to get it all written down. I wanted to share my story to help others understand the significance of the 3.2 and why it’s important to so many people. Wow. I am a little behind in the blogging world so just catching up on this now. I cannot imagine what you and the entire campus went through on that day. Many of these shooting are hard to deal with but to have it be so personal as well. I am sure it changes so much of your entire college experience.